(1989)Van Dorn mdl. 200-RS-8F-VV 200 Ton Plastic Injection Molding Machine s/n 2802 w/ 30 ¾” x 30 ½” Platens. (1987)JSW mdl. 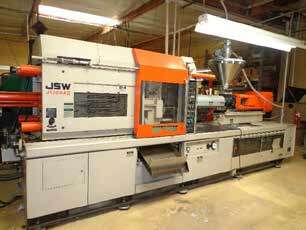 J150SA II 150 Ton Plastic Injection Molding Machine s/n 286710404 w/ 27” x 29”” Platens. Van Dorn mdl. 75-RS-3F 75 Ton Plastic Injection Molding Machine s/n 75-RS-3F462 w/ 18 ¾” x 19 ½” Platens. Boy mdl. 50T2 50 Ton Plastic Injection Molding Machine s/n 51520 w/ 19 ½” x 19 ½” Platens. Negri Bossi mdl. NB-25 25 Ton Plastic Injection Molding Machine s/n NA w/ 12 ½” x 14 ½” Platens. (2)Ball & Jewell mdl. M-200-WT 10” Plastics Granulators Advantage mdl. PTS-200-1P-SP Process Cooler s/n 9661. Victor mdl. 1640 16” x 40” Geared Head Gap Bed Lathe w/ Inch/MM Threading, aper Atch, Tailstock, Steady Rest.